Whether it is a brief hospital admission, a follow-up check-up, surgery, or recurrent hospitalizations due to chronic illness, a child who is hospitalized creates a crisis within the family. Child’s responses to hospitalization are associated to the developmental level but usually include fear of separation, loss of control, injury, and pain. The smoothness of transition from home to the hospital relies on how well the child has been prepared for it and how the child’s physical and emotional needs have been satisfied. Providing support to the family, supplying them with information, and empowering their participation in the child’s care adds to the adjustment and well-being of all concerned. 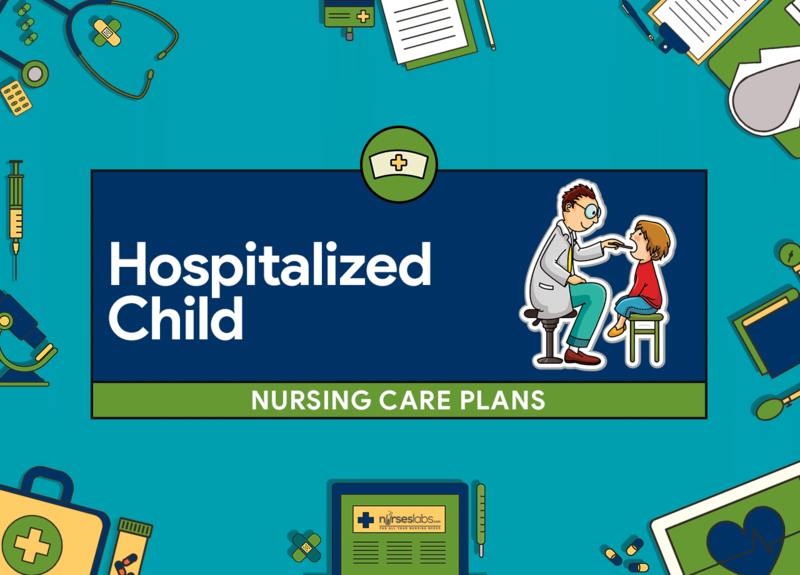 The major nursing care plan goals for a child who is hospitalized include increased ability to perform self-care activities, relief of anxiety, and an increased sense of power of family in making decisions and absence of injury. Child will attain maximum self-care capability with or without the use of aids. Assess physical tolerance and abilities to perform ADL, and play activities and restrictions imposed by the illness and medical protocol. Provides information about the amount of energy and effect of illness on activity level. Provide personal care for the infant and small child; assist child and adjust times and methods to fit home routine. Provides needed assistance where using patterns and articles that encourage the parent to assist the child. Child is accustomed to using and doing. Anticipate child’s needs for toileting, feeding, brushing teeth, bathing and other care if unable to manage on own; allow the child to do as much as possible. Prevents embarrassing experiences with toileting and maintains comfort with personal cleanliness and appearance. care according to age, developmental level, and energy. Promotes self-esteem and independence. Balance activities with rest as needed; place needed articles and call light within reach if appropriate. Prevents fatigue by conserving energy and promoting rest. perform ADL, allow choices when possible. Assists child in performing self-care for ADL. Encourage rest and quiet periods. Ensures proper rest and prevents fatigue. Instruct parents to interpret child’s needs if the child is too young to talk. Provides anticipatory care for the child. Provide instructions in bathing, hygiene, toileting, feeding, dressing while in hospital environment and inform of differences from home care and methods as needed. Promotes performance of ADL skills already known by child. Encourage parents to assist the child in ADL but to allow the child as much independence as condition permits; inform parents that a place is provided for their personal needs in order to allow them to remain with the child. Promotes independence and some control by the child without separating the child from parents.